On her self-titled fourth LP, Annie Clark (a.k.a. St. Vincent) shares stories—inquests into social media, a naked standoff with a snake—on tracks that are at times glitchy and convulsive, at others woozy and rhapsodic. 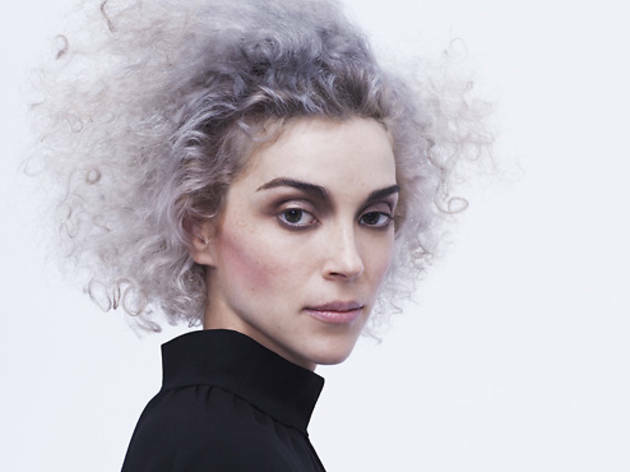 We talked with the newly silver-haired visionary prior to a big NYC show, taking place the day after the release of St. Vincent. When did you move to NYC and what drew you here? I moved to New York when I was 21, then I ran out of money and moved back in with my parents in Dallas. I joined the Polyphonic Spree and toured for a few years, and I moved back here in 2007. I grew up in Texas and always felt like a freak and a weirdo, and I wanted to come to the refuge where all the freaks and weirdos escaped. I love New York very much—but I think it’s a place that you have to prove your devotion to. 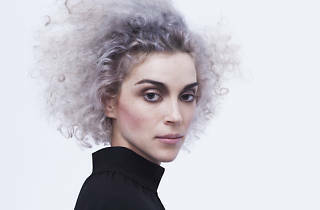 I heard that you started working on St. Vincent 36 hours after wrapping your David Byrne collaboration, Love This Giant. Do you ever have writer’s block? I’m not sure exactly what that is. After doing the Summer Sonic fest [in 2012] for Strange Mercy, I flew from Japan to New York and started rehearsals the next day for Love This Giant. Right after that, I started writing this record. I had all these ideas and pictures and notes that I’d taken, melodies that I’d recorded in my phone. The reason I don’t have writer’s block is because I’m collecting things. It’s like a squirrel; you save up for winter. What did you learn from working with David Byrne? The things I learned from David are more existential and outlook-based. He’s a totally fearless person. He doesn’t look back; he’s only ever looking to the future to satiate his creative mind…which is insatiable. I approached this record with a lot of fearlessness and thinking about not just the music—I got very excited about reinventing the visual world I’d built up. This album is a lot more dancey than your previous solo albums. I was really inspired by seeing people dance at the Love This Giant shows. When I sat down to write this new record, I wanted to make sure it had the accessibility and the danceability and poignancy of a party record, but that it also had heart and pathos and empathy. Speaking of shows, I noticed you started stage-diving more. Why is that? I wanted to raise the stakes, and there’s no higher stakes than risking your life and limb. Once I started doing it, I realized it was such a thrill, and I got addicted to the adrenaline of it. There’s nothing like that thrill of real-time chaos. It looks scary, to be honest. I’m scared of roaches, but I wasn’t scared of that.